Website suggestion – 522 anatomy helpful? As a website feedback suggestion (tagged in the 522 feedback category) I’m wondering if an “anatomy of 522” image might be helpful? I know this is explained with text and images in the intro, but maybe a simple anatomy is more clear? The biggest learn curve and complication is that “posts” refer to something different in the WP environment (they create separate artifact/post pages), whereas “comments” and “reviews” add commentary to an existing “post.” It can be confusing when we need to submit a post versus a review. In this case, students may refer to the “how to use this blog page” and see only instructions on how to create a new ‘post’ when what they need to do is submit a review on the bottom of an article/post. 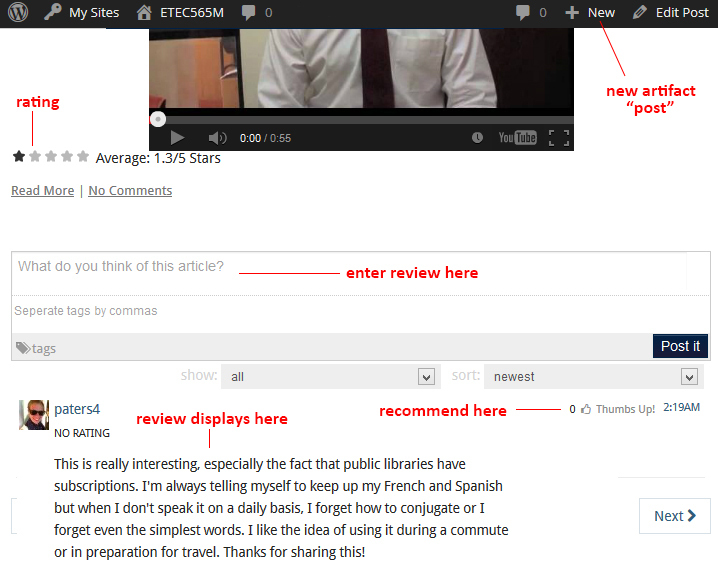 Maybe in the next evolution there is an explanation of reviews on the “how to use this blog” page, and/or more elaboration in weekly tasks to submit reviews using the reviews feature (located at the bottom of a post)?